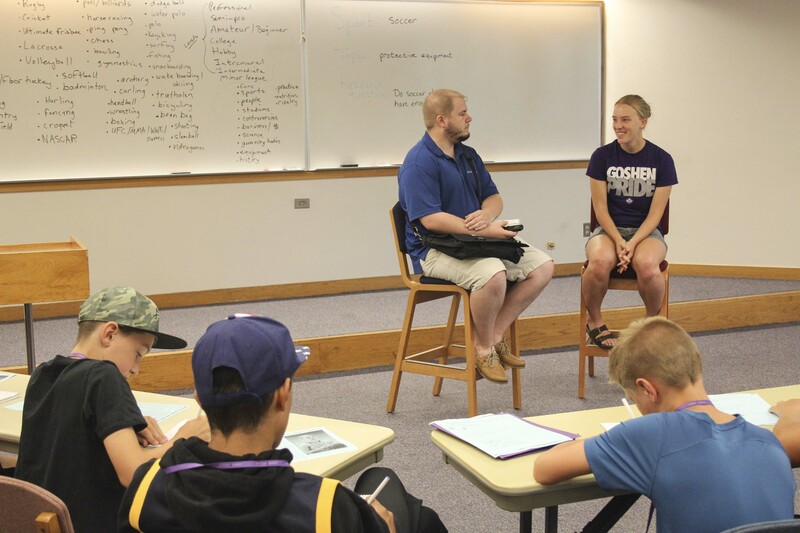 Sophia Sears during a simulated locker-room interview at Goshen Write on Sports. Sophia Sears, who graduated from Goshen College in May with the school career and single-season records in free-throw percentage, told Goshen Write on Sports campers that when she stepped up to the line, even as a senior in college, she pictured herself back in her elementary school gym in Paoli, Indiana. That’s where her mother was a schoolteacher and where Sears spent countless hours alone in the gym, shooting hoops. Sears averaged 84 percent at the free-throw line across four years at Goshen College, with a top mark of 86 percent in 2015-16. Sears was named “Athlete of the Year” at the inaugural Maple Leaf banquet. She earned NAIA All-American recognition for the second consecutive season, receiving honorable mention after scoring 13.7 points per game despite missing six games due to injury. Stephen Brooks, sports editor at The Goshen News, in a mock interview with Sophia Sears. She helped lead the 2015-16 team, which set a single-season win record and made the deepest national run of any Goshen College team in history, all the way to the NAIA Division II Final Four. 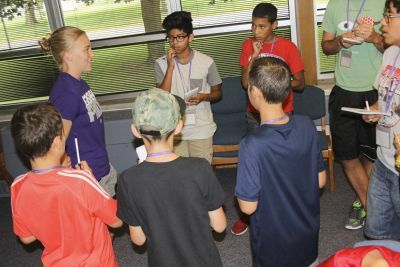 Sears was the second guest athlete to appear at the Goshen Write on Sports camp. On Tuesday, Sam Grewe, a silver medalist at the Paralympics, attended the camp. Stephen Brooks, sports editor at The Goshen News, served as the primary interviewer on both days. After Brooks asked questions and provided tips on effective interviewing, students had a chance to ask questions of their own, both in press conference and locker-room simulated settings. Sears, who majored in biochemistry, will begin doctoral studies in the fall at the University of Louisville, focusing on pharmacology and toxicology. Apart from her studies, she will serve as a research assistant in a cancer lab. “I’m also excited to attend many U of L basketball games,” she said.